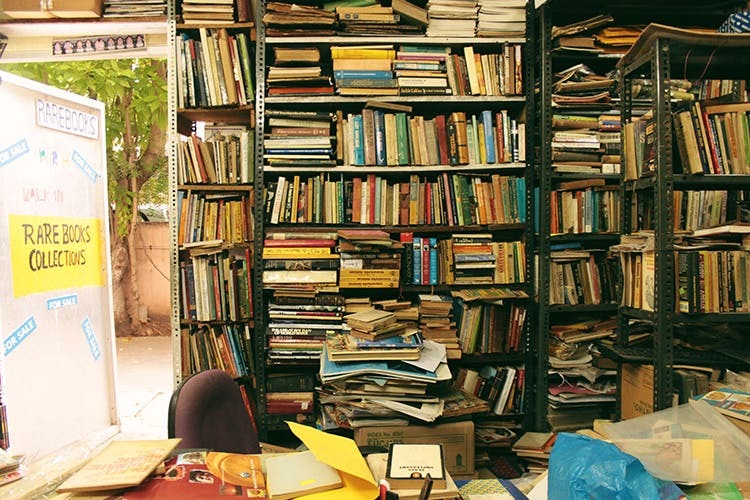 Rare Books is a bibliophile’s treasure trove, based out of the owner’s garage space in an apartment in Raja Annamalaipuram. A complete antithesis to a 21st century shopping experience, this little shop stores rare books all the way from the 1860s. Automatic glass doors, alphabetically arranged books and air-conditioned premises are what you probably expect at a modern day bookstore. You’ll find none of this at Rare Books. A garage shutter with the owner’s number hand-painted on the top right will greet you in this little nook in RA Puram. Call the number and you can hear the landline ring upstairs on the first floor. Mr Govindaraju will assure you that he’ll be down in a couple of minutes, and he will be! A shop that started almost a decade ago, Rare Books has close to 5,000 books spanning various genres such as literature, history, philosophy, culture, heritage and the arts. If you’re a geography geek, swing by to browse through more than a thousand editions of the National Geographic magazine at the store. Rare Books used to house a much bigger collection — almost 20,000 books — which an avid collector bought in its entirety about five years ago. Not willing to give up his passion, the owner started from scratch all over again. One thing Govindaraju prides himself on is his collection of vintage print ads. Preserved starting from the 1950s, you can find old newspaper ads for transmitter radios, camera equipment, sarees and anything else you can possibly think of. You can also trace the advertising history of many conglomerates such as L&T, Coca Cola, Lakshmi Mills etc. If solving crossword puzzles is your thing, you can pick from close to 500 puzzles at this shop. Love vintage newspaper and magazine cartoons? Choose from more than a thousand panels created by the likes of India’s favourite RK Laxman, World War II political cartoonist David Low and British satirist Ronald Searle. Don’t walk in here expecting to spot the book you want and immediately walk out with it. A visit to Rare Books is — more than a chance to shop — a chance to explore. If you have a specific book in mind, ask Govindaraju and all he’ll tell you is whether he has it or not. He can’t point you to where it is because there’s no order to his beautiful chaos. So, you’re left to search for what you want and more often than not, people end up finding more treasures than they initially set out to find.